Learn about condensation, evaporation, precipitation and accumulation – print these water cycle worksheets and diagrams and learn all you need to know about the water cycle. It goes up, it goes down – it’s everywhere and it’s connected! Your students will grasp the basic mechanisms and learn all the names associated to water cycle. We have already shared a wonderful learning resource – a set of oceans and continents worksheets and we think these two will work great together – as oceans are an important part of the cycle – and where there are oceans there are continents which too play their big role. Now let’s do some learning! As with most of our printable worksheets, these too come in a variety of versions to best suit your child’s leaning process and age. From simple ones for younger kids (basics for kindergarten and lower grades) and more detailed for older students. The same goes for diagrams (although you can go way more complex). The simple and “advanced” pack each contain 6 pages – color and black and white version. You will find a diagram with all the parts of the water cycle labelled (perfect for teaching). A blank worksheet where you can write your own definitions or have your students describe the cycle. There is also a worksheet with empty squares where kids have to name the parts of the cycle. You can use these to test the knowledge on this subject. We have also created a crossword puzzle, a word search puzzle and a worksheet where kids have to explain what some of the terms mean. What is the best way to use these worksheets? We recommend starting with water cycle word search puzzles and crossword puzzles as they help with reinforcing the vocabulary – condensation, evaporation, precipitation and accumulation can be a bit hard to remember for some kids. Word searches and crossword puzzles are fun and stress free way to reinforce those terms. Once your students or kids if you homeschool are familiar with those terms, we recommend using and talking about the water cycle with diagrams with all the words labelled. Let the kids explore the cycle and think about what happens and what follows. 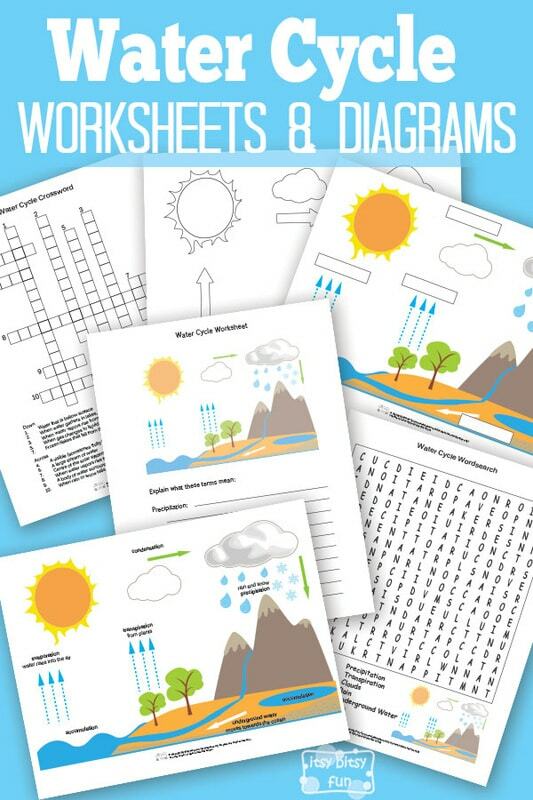 After that, you can test the knowledge by using any of other water cycle worksheets in this set. 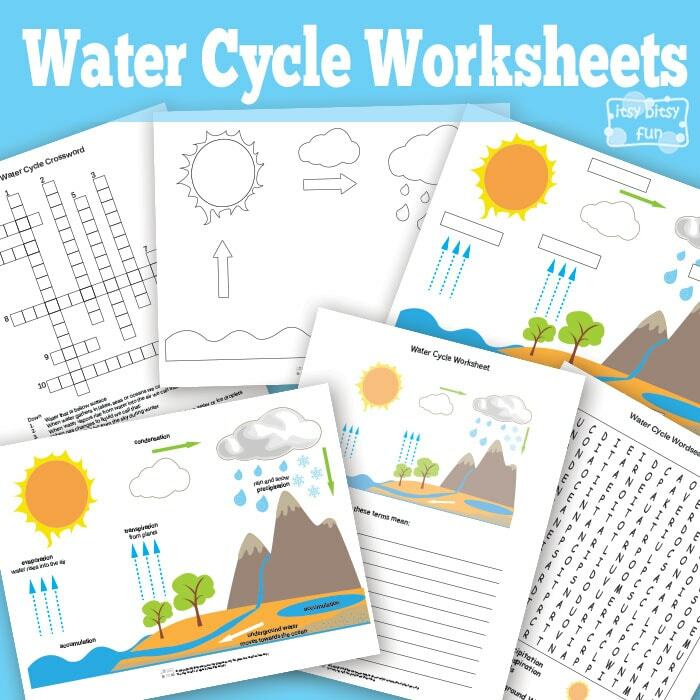 Get your free printable Water Cycle Worksheets and Diagrams here.